I had a 8 boat party today on the White River. The fellows at the dam decided to throw us another curve ball by kicking on a couple generators early. I was ready for it today. I started drifting minnows on a split shot as soon as it hit me in the White Hole. I stayed right on the very front of the rise and fished all the way down to tool creek just below the rainbow hole. At 10:30 we headed back up the river to get lunch ready for the group. We had put 10 brown trout and several rainbows in the boat so it was a pretty good morning. At lunch we learned that a boat on our trip had landed a 30 in giant. 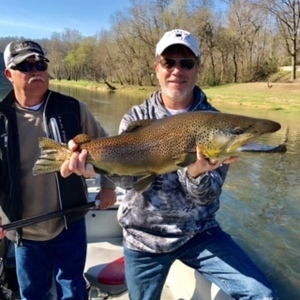 They had worked their way up to the stetson hole and landed 7 browns including the big one. All on minnows. We ended the day anchoring with the minnows and landing 7 more browns for a total of 17 for the day.